A painting composed inside the Slate Occupation. Image: Josh McNamee. 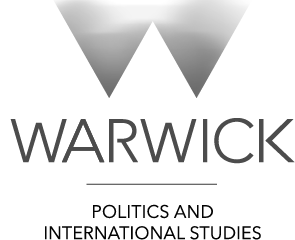 On December 2, 2016, a number of Warwick for Free Education (WFFE) activists initiated direct action against Warwick University, occupying The Slate, Warwick’s new £5.3 million conference centre. 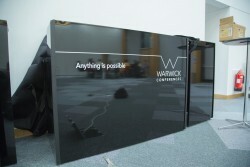 WFFE’s aim was to pressure the University into accepting a specific set of demands: opt out of the new Teaching Excellence Framework, agree to Warwick Anti-Casualisation’s demands for fair teaching conditions, scrap the injunction against protest and apologise for initiating police action against students in December 2014. On December 16, the occupation succeeded: the University made major compromises on two demands, and accepted the third demand in full. By any standard, the Slate occupation was a historic event for student politics in general and for protest at Warwick in particular (not least because of the scrapping of the injunction against occupational protest). A blockade at one of the Slate’s fire exits. Image: Josh McNamee. Viewed in isolation, it would be very easy to characterize WFFE as an out-of-touch radical group with “impractical” demands. But such a reading of the situation would be egregiously incorrect. It would mean constructing a political discourse predicated solely on the terms set out by the establishment. Such discourses validate the status quo and overlook the significance of questioning how certain demands become extreme, and thus infeasible, while some don’t. Needless to say, in most cases (as in this), it is the authority one is protesting that assigns these labels. The acceptance of problematic categories such as “too radical” or “impractical” soon begins to support the very structures that were were to be challenged or dismantled in the first place, rendering the very concept of protest redundant. It is also important to note that categorisation of what demands are radical or moderate, infeasible or practical enforces a monolithic politics of the possible. The state rejects any tactic or demand it doesn’t agree with as “too radical”. The establishment has appropriated figures like Mahatama Gandhi and Martin Luther King, who both advocated radical civil disobedience, as messiahs of non-violence. Here, as Nicholas Mirzoeff points out, non-violence has come to mean compliance with the state, something neither Gandhi nor King displayed or intended. It seems that in Western liberal societies, the only acceptable way to register discontent and affect change is through electoral politics. Unfortunately, electoral politics achieves little more than the reproduction of extant power structures, which favours the powerful. Modern democracy perpetuates the myth that the popular will of “the people” can make any change possible. This category of “the people” is greatly contested and conveniently excludes those at the margins of current social structures. A poignant image from the Slate occupation. Image: Josh McNamee. This dominance of mainstream electoral systems in Western political discourse has eliminated the scope for any genuinely subversive politics. The effects of the absence of any “radical” politics can be seen quite clearly in the 2011 consumer riots that took place in London and other cities of England. Winlow et al note that after the 2008 economic crisis, the left-wing critique of the establishment as self-interested and greedy had been proven correct. The time to forge an oppositional politics was at hand but the rioters failed to speak out and channel their anger productively because capitalist universalist democracy had robbed them of the very language needed to articulate any political contestation: to identify capitalism as the real enemy. This unfortunate disappearance of alternative ideologies that may enable us to understand and critique our world better secures the undisrupted continuity of capitalist universalism.1 At the same time, however, we must realize that little is gained by timidly acquiescing. Widespread acceptance of the status quo only makes protest more important. Bold and brave tactics such as occupations are saturated with news value and thus have the potential to effectively fracture the wider mainstream consensus, alerting us that something is wrong and needs to be challenged. Occupations can, in and of themselves, politicise and beautifully transform spaces in the process of (re)claiming them. The WFFE occupation is especially poignant in this regard. The Slate exists solely to generate revenue for the University, and has absolutely no use for students. 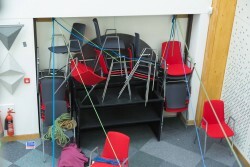 During the occupation, however, the venue was repurposed. WFFE activists write: “Like so many student occupations in recent years, the occupiers reimagined the space as one of collaborative political education”. A group of Occupy Wall Street Protestors. Image: Shankbone 49, Wikimedia Commons. 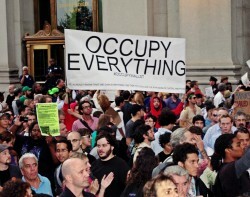 The Occupy Wall Street movement of 2011 began in Zucotti Park in New York, close to Wall Street itself. In the process of creating a discourse focused on “the 99%”, Occupy Wall Street reclaimed supposedly public spaces, problematising and questioning the very nature of public spaces. The 2013 protests in Turkey, where protestors occupied Istanbul’s Taksim Square, grew out of a battle against the government plan to remove Gezi Park, one of the few open spaces left in modern Istanbul. 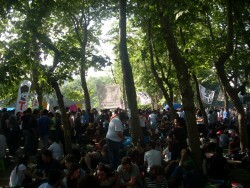 Gezi Park itself is culturally and politically significant. As Pedro Levi Bismarck notes, the park and square constitute a referential space that speaks of the complexities embedded in the foundation and secularisation of the Turkish republic. It has today become a space of contestation for Turkish democracy. Erdogan’s plan to raze the park to the ground aims at making the space less politically charged and less receptive to political demonstrations. Cairo’s Tahrir Square, which served as the center for 2011’s Egyptian Revolution, has a significant political history too. The Square saw its first demonstrations in 1946, related to anti-colonial sentiments. Then 1952 saw protests against King Farouk’s government, which lead to the Great Fire of Cairo, wherein a few buildings of the area were burned down. After the Army coup of the same year, Gamal Abdul Nasser assumed power as President. In the 1960s, he renamed the Square as Tahrir (liberation in Arabic) to commemorate the departure of the British from Egypt. A view of the crowd at the Taksim Square occupation, June 4, 2013. Image: VikiPicture, Wikimedia Commons. These reclamations and transformations are accompanied by the most amazing displays of solidarity, marked by a shared vulnerability and, more importantly, endurance. As Judith Butler points out, it is important that as bodies “we arrive together in public”, publicizing the fact that we require each other for food and shelter. Indeed, WFFE claim that networks of solidarity to enable the occupation were already in place and note that University staff helped in organising events and support. In the context of the Taksim Square occupation, Zeynep Gambetti eloquently noted how “bodies multiply with every gush of tear gas, spaces expand with every police attack, and the quality of contact among the bodies increases with every propaganda speech”. The protests of the Egyptian Revolution evoke a similar response: in defiance of the military curfew, thousands of protestors remained camped out in Tahrir Square and stood their ground even as army troops fired into the air to disperse them. 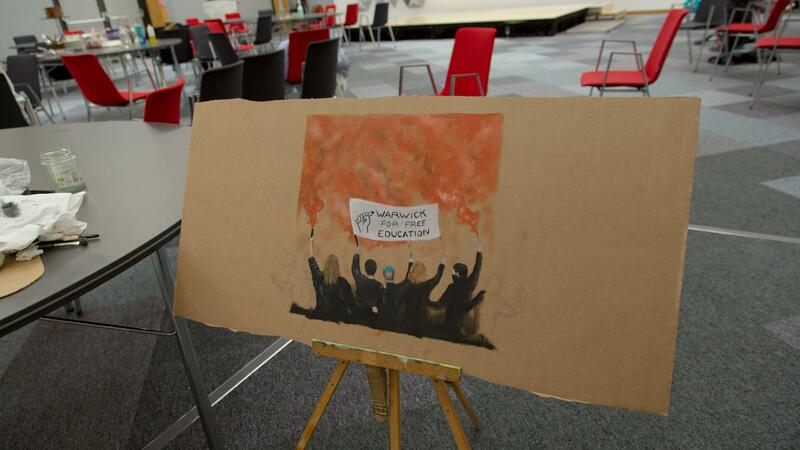 The WFFE occupation was a strict and absolute repudiation of the false claim that student politics is useless and closed-off from the “real world”. While students at the University of California, Berkeley grapple with very real threats the Trump presidency poses to undocumented students there,2 students at Jawaharlal Nehru University in Delhi, India continue to dissent against their government’s creeping nationalism and the University administration that seeks to silence them.3 Here in the UK, of course, WFFE is part of a wider effort to challenge the neoliberal university and resist the marketization of higher education. It is quite evident, then, that student politics responds to contemporary events around the globe. 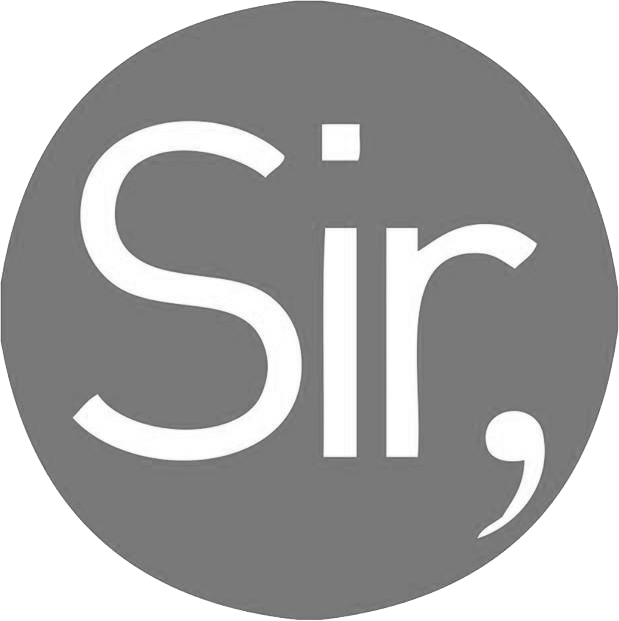 To claim otherwise is to ignore a potent voice. Protest and student politics involve individuals who have the most to lose by failing to speak out. And in an increasingly retrograde global environment, where the powerful count on young citizens’ ignorance and apathy to perpetuate horrible crimes, both are essential. As Arundhati Roy says, then: “The only thing worth globalizing is dissent”. Vardaan Aggarwal is a second-year Economics, Politics and International Studies student. He is the Politics and Economics editor at the Warwick Globalist.